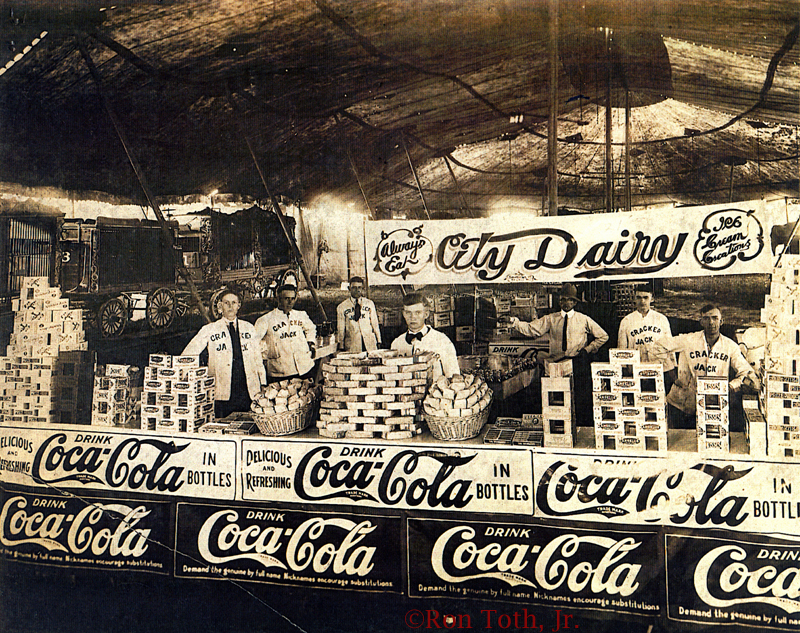 Here is a large Circus Concession Stand photograph. The circus name and the location are unknown. Judging by the packaging it is believed to be from 1917 to around 1920. The Cracker Jack boxes have the earliest Sailor Jack on them. There are seven employees under a large circus tent waiting for the paying customers to arrive. Six of the men are wearing Cracker Jack vendor jackets. On the table there are stacks of Prize Cracker Jack boxes, Angelus Marshmallow boxes, Pop Corn Bricks, baskets full of bagged peanuts, candy kisses, a few other stacks different candy boxes, and cigars boxes. The front of the tables have Coca-Cola banners. Behind the tables are wooden cases of soda bottles. The stand is also selling "City Dairy Ice Cream Creations". In the background three circus wagons can also be seen. Last edited by Ron Toth, Jr. on Tue Mar 31, 2009 6:20 am, edited 1 time in total. As always, Ron, your photos are beautiful. Yes, you would really be hot stuff if you showed up for a convention in you Angelus mobile. But beer and Cracker Jack? I'm not so sure about that combination.